After Brexit: Nation or Class? Swastikas painted up in Armagh, Sheffield, Plymouth, Leicester, London and Glasgow. A man in Glasgow ripping off a girl’s headscarf and telling her “Trash like you better start obeying the white man." Man arrives at British Legion commemoration in Essex with T-shirt emblazoned with “Yes! We won! Now SEND them BACK”. A 34 year old pregnant woman losing her baby after she was kicked in the torso in a supermarket in Milton Keynes in a violent racist attack. It began with verbal insults but it wasn’t long before the attacks turned violent. The day after the referendum, a Polish man was attacked after being approached by two men outside a pub in Yeovil, Somerset and asked if he was English. He was repeatedly kicked and punched as he lay on the floor and suffered a fractured cheekbone and serious damage to his eye. A few days later, an Asian man was stabbed in the back in Rochdale after a group of men yelled racist abuse at him. In early July a Polish family in Plymouth had their house torched by arsonists who left a note telling them to “go back to your f*ing country”. In August, Arek Jóźwik, a 39 year old Polish man, was beaten to death by a large group of teenagers in Essex, and in September Zdenek Makar, a 31 year old Czech man died after being attacked following a row in a takeaway. Nothing to do with Brexit say those who supported it. But facts are stubborn things as even official sources show. A Home Office report using data from 31 police forces showed 5,468 racially or religiously aggravated offences in July, up 41% compared with the same month the year before. A separate report from the National Police Chiefs’ Council shows that in the week following the vote the number of incidents immediately rose by 58%, and at the end of July was still 49% compared with the same point in 2015. Britain’s most senior police officer, Sir Bernard Hogan-Howe, called the increase in race-hate figures a ‘horrible spike’ but it is more than that. The figures remain high and are still not down to pre-referendum levels. European embassies in Britain have logged dozens of incidents of hate crime and abuse against their citizens since the referendum, with more attacks on Poles than against all the other nationalities put together, but the biggest attacks of all have been on people of South Asian origin. According to the Daily Mirror, tension is highest in the areas with the strongest Leave vote like Suffolk, Gwent, Norfolk and Leicestershire. The chief constable of Leicestershire Police reported that hate crimes there have doubled since the vote. It’s no coincidence that the lowest areas for hate crime have been in the areas with large Remain votes, such as Scotland and Greater Manchester and Merseyside. The number of homophobic attacks is also growing, more than doubling in the three months after the vote. Disability rights campaigners are also reporting a rise in incidents. And while some of the media have dismissed these figures as insignificant, we should remember that most incidents aren’t reported and in any case, any attack won’t feel insignificant to the person suffering it. Unfortunately much of what is reported goes unpunished (the European Commission Against Racism and Intolerance reckons roughly half of all incidents will go without any charges). Though all of this is shocking, it’s not surprising. The UN recently issued a report by the Committee on the Elimination of Racial Discrimination which said the referendum campaign had been marked by ‘divisive, anti-immigrant and xenophobic rhetoric by UK politicians’. They felt that the existing laws in Britain against hate crime weren’t being used, creating a ‘climate of impunity’, and that politicians ‘failed to condemn’ racist abuse and created prejudices during the campaign. This is true, but in fact it had been going on for several years before the referendum. The government has been stirring up the racist pot for a long time. Take the 2013 Home Office campaign when they used mobile vans in London with the anti-immigrant slogan: ‘GO HOME or face arrest’. No coincidence then that a quarter of incidents reported after the vote specifically used the words ‘Go Home’ or ‘Leave’. The campaigns leading up to Brexit brought racism into the mainstream. The ‘debates’, such as they were, hardly discussed the real issues (one reason why the Brexiteers haven’t got a clue how to actually carry out Brexit now). Farage, Gove and Johnson may have ridden the anti-immigration tide but it was created by mainstream politicians, one of whom is the current Prime Minister who openly stated in a newspaper interview in 2012 that: ‘The aim is to create here in Britain a really hostile environment for illegal migration.’ As we have argued in many previous articles she was only articulating the cynicism of the ruling class. And it’s still going on. Part of the aim of absorbing UKIP supporters into the Tory party led Home Secretary Amber Rudd to come up with a plan to force companies to list their foreign workers. The plan was dropped after an outcry by employers who don’t want their extra-cheap labour forces threatened but it does point to the central game being played by the ruling class. On the one hand they need a cheap, plentiful workforce and the free movement of labour currently provides that. It’s one of the reasons they’re finding Brexit so difficult. On the other, they’re playing the game of divide and rule, pointing the finger at ‘foreigners’ and blaming them for all the ills caused by the capitalist crisis in general and the fallout from the 2008 crash in particular to which they have no real solution. And it’s getting nastier. The Leave vote has created a shift in public discourse in the UK where bigotry was suddenly acceptable, where migrants and refugees were de-humanised and despised, where the political environment suddenly became hostile to anyone not conforming to a narrow ethnic (and narrow-minded) white, English base. ‘Taking back control’ has given voice to a number of violent bigots who now feel brave enough to lash out at anyone they feel ‘doesn’t belong’. True, for a minority of the working class the nationalist and racist blame game is an easy one to swallow and there will always be a small section of the working class that acts as a mouthpiece for the very worst of the bourgeoisie. But when our class fights for its own interests, when it is moving forward and united under its own slogans, this tiny minority is marginalised and silent. But we have to go further. There is much talk of identities these days but the key one for the last 100 years has been whether you identify with the nation or with the class to which you are tied by virtue of a shared collective experience of exploitation. When the capitalists call on us to “defend our nation” they are right. It is their country. They own it after all. For workers who own only their ability to labour the nation is an abstraction. As Karl Marx pointed out 150 years ago “Workers have no country”. But we do have a world to win. The current problem is that the working class everywhere is fragmented and weak. Despite austerity, cuts, speed-ups and a whole raft of new forms of exploitation, resistance so far has been only episodic and spasmodic. However, despite all the sacrifices by workers the capitalists have still no solution to a crisis of low profitability and low growth. World trade has fallen and the world economy is stagnant. Protectionism and competitive devaluations are already becoming widespread. Trade wars are usually the precursors of shooting wars. Around the world from Ukraine and Syria to Yemen and the South China Sea international tensions are rising. We are in a race against time. Will the continuing crisis provoke a new international and internationalist consciousness which takes an organised form or will the dead-end of capitalism lead to a generalised war that throws us back to the Dark Ages? For revolutionaries like ourselves the only alternative to more barbarism is the creation of an international working class movement to fight for a new society without exploitation and without racist and sexist oppression. It will be a long fight but will be shorter the more people rally round those nuclei of class conscious workers already in the fight to get us out of this hateful mess. This is slightly longer version of the article which appears in Aurora _39_. The picture at the head of this article is a response of Dr Junaid Masood to the Brexit vote, posted on Facebook the day after the referendum while on his shift at Homerton University Hospital. 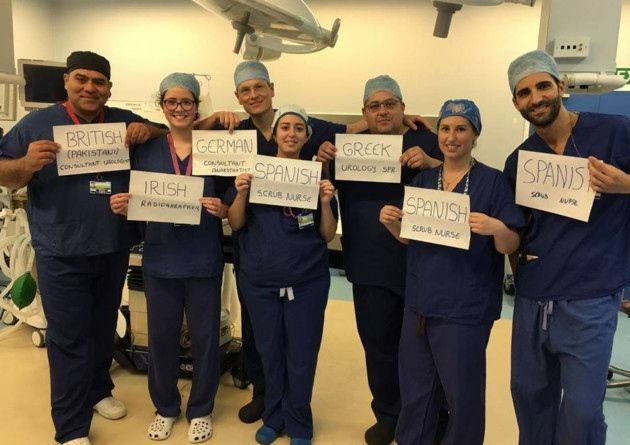 Entitled “We are Europe!”, it shows the team he works with: three scrub nurses from Spain, a German consultant anaesthetist, an Irish radiographer, a Greek urology specialist registrar and Junaid himself, a British consultant urologist. Looking again at FT's final paragraph, some practical concerns emerge. If we are in a race against time, then is seems unreasonable to criticise readers who seem to be impatient. If there is sufficient time to make a long fight shorter, how are readers to recognise and locate 'nuclei' of class conscious workers ? If they manage to do so, and rally round, then what ? It sometimes seems as if supposed pearls of wisdom are being hurled at us like confetti.